Size of this PNG preview of this SVG file: 800 × 500 elementa imaginalia. Aliae mensurae: 320 × 200 elementa imaginalia | 640 × 400 elementa imaginalia | 1 024 × 640 elementa imaginalia | 1 280 × 800 elementa imaginalia | 1 600 × 1 000 elementa imaginalia. 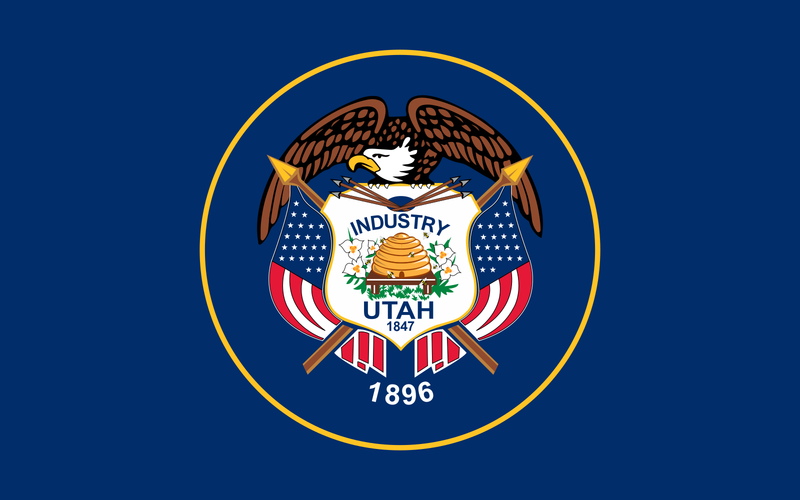 English: Flag of Utah. Please do not revert to the "21:58, July 26, 2011" or any earlier version, as those versions are factually inaccurate. Română: Steagul statului american Utah. 19:30, 6 Aprilis 2015 2 703 × 1 626 (163 chiliocteti) Oganesson007 The previous version of the flag, which I made it's SVG, was Utah's flag in enhanced variant. 00:17, 1 Ianuarii 2015 1 280 × 768 (657 chiliocteti) Illegitimate Barrister factually-accurate version now. 17:08, 17 Maii 2009 660 × 440 (86 chiliocteti) Svgalbertian Layer ordering issue cut off top of beehive.